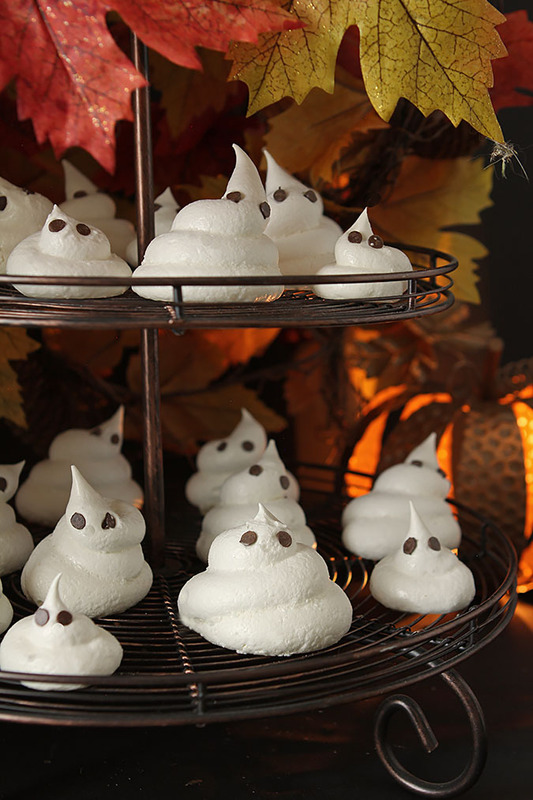 These Meringue Ghost Cookies for Halloween are so easy to make; little hands can help. The perfect treat for kids of all ages! 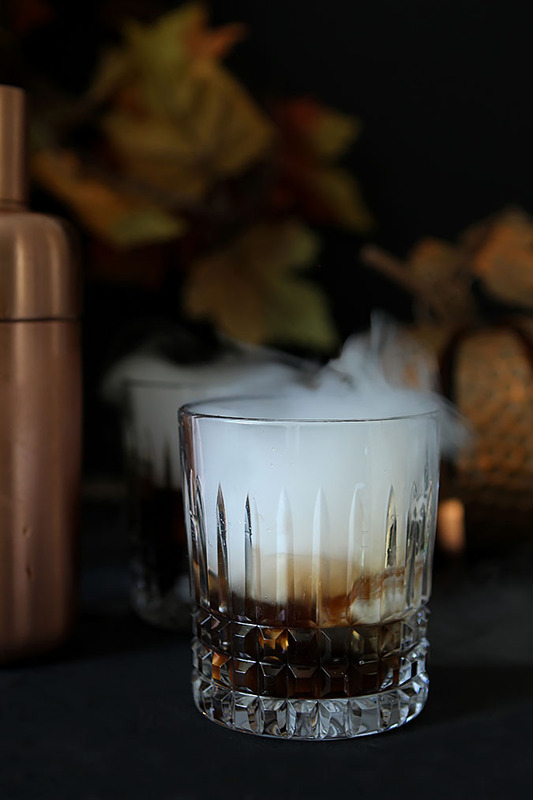 A couple of weeks ago I got together with a friend who also blogs; she and I had plans to make cocktails for today’s Progressive Eats event and we were going to do it right…dry ice and spooky all around. Well…what the heck happened Barb? Timing happened! I didn’t get to my cocktail until the next day; my Friday Cocktails weekly post was only 2 days away and well, doesn’t take much imagination to figure out I punted. The spooky good Ghost in the Graveyard Cocktail was published last Friday for Friday Cocktails and I was back to square one. My friend Ansh from Spiceroots persevered though and her cocktail contribution is fitting for the theme she chose as this month’s host, A Spooktacular Halloween Party. Be sure to check out her and other’s contributions after the recipe. Yes, we are a bit late; someone put a spell on us! Still, these cookies? So easy; three ingredients including the chocolate chip eyes. Mix up some meringue and let them dry in a 200 degree oven for a couple of hours and voila…done! I started making these Meringue Christmas Tree Cookies years ago for the Christmas Holiday; I love how easily they segued to Halloween. These were much easier too…no glitter or stars, just a couple of mini chocolate chips inserted bottom side out; regular chocolate chips would work too. I had some little hands helping so plan on someone getting very sticky…but we had fun! 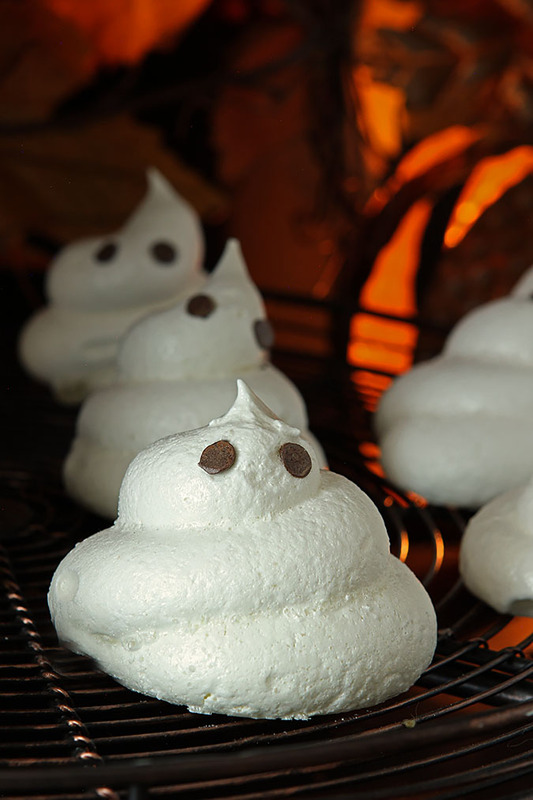 These Meringue Ghost Cookies for Halloween are really so perfect; meringue cookies literally melt in your mouth. Doesn’t that seem most appropriate for a ghost? BOO!! Preheat oven to 200 degrees F and place the rack in the center of the oven. Beat the egg whites on low-medium speed until foamy. Add the cream of tartar and vanilla extract powder and continue to beat the whites until they hold soft peaks. Add the sugar, a little at a time, and continue to beat on medium-high speed until the meringue holds very stiff peaks. Pipe meringues in a ghost shape using a large piping tip or snip the end of a ziploc bag. Add two chocolate chips to the top part for eyes and if desired, a larger one for a mouth (optional). Bake the meringues for 2 hours, rotating the baking sheet from front to back about half way through to ensure even baking. They should not be brown but crisp on the outside. Cool completely. The single biggest issue for success with meringue is to start with super clean beaters and bowl. ANY touch of fat on either will doom them and you will have blobs, not ghosts! These are adorable! They’re perfect! I haven’t made meringues in years, and you’ve totally motivated me to make some. So easy…but cute too. Take a peek at my Christmas tree ones; I decorated them a bit more but they made great gifts for neighbors. I love how cute and easy these guys are, Barb! Love love these cute meringue cookies! I will make a batch for my neighbors 3 year old. she will eat the heck out of them! You know I’m up for that…any time! Very cute, Barb! My family loves meringues and these would pass their picky palate test!! P.S. Last week’s cocktail is fabulous, too.